Will I Need a Permit for My Backyard Construction Project? Are you dreaming of a new outdoor living space? Will it require permitting by your city or county government? Building permits can be confusing and time-consuming to research and obtain for many homeowners. The fact that regulations and building departments can vary from location to location further complicates things. At Archadeck of Raleigh-Durham, handling permits is an important part of the service we provide. Throughout the Triangle, we have working relationships with the different local government entities that regulate building projects. We understand the permitting process and know how to secure what is needed. Q: When do I need a permit for a porch addition? A: A permit is required for any addition to your home that extends the footprint of the home. Q: Will I need a permit to add a new paver patio? A: Currently, paver patios don’t require any permitting or inspections. However, the impervious surface allotment of your property may limit what type of patio you can build and how big it can be. Also, some patio amenities like gas grills, firepits, or electrical additions may require a specific permit. Q: Will I need a permit for re-decking? A: No. As long as there are no changes to the structural supports or framework of the deck, a building permit is not required to replace the decking boards and railings. Because the deck’s support structure doesn’t have the same exposure to harmful UV light from the sun, it generally has a much longer lifespan than the decking and railing. So if you’re happy with your deck’s current shape and size, we can often save you time and money by simply replacing the decking and rails. Q: Do I need a permit to add porch windows such as Eze-Breeze? A: No. A vinyl window and screen system like Eze-Breeze is a great upgrade to a porch and won’t require any permitting or inspections. Eze-breeze windows add tremendous value to porches and can typically be installed in just a few days. While permits and inspections may seem like something to avoid or fear, these regulations are in place to provide protection. They ensure a certain standard of quality in production and environmental development. They protect you, as well as those visiting your home, from accidents caused by poor construction. And, they protect a future home buyer, if and when you choose to sell your home. 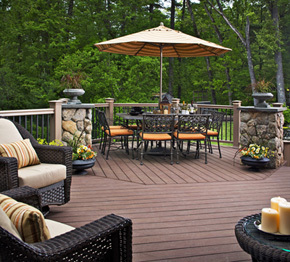 If you are planning a new outdoor living project for your home, give Archadeck of Raleigh-Durham and the Greater Triangle a call today: 919-973-1523. We’ll deal with the permits and all other details, so you don’t have to. We look forward to working with you!